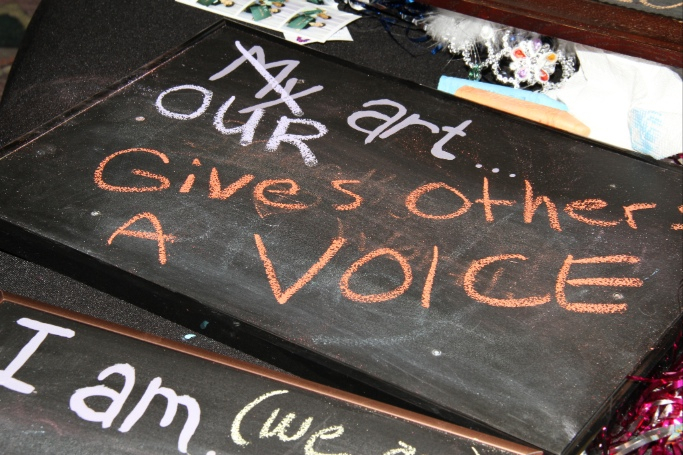 During our annual board retreat a few months back each of us were asked to contribute to KFW’s blog. My assigned month was June and though I’ve never considered myself a procrastinator, it seems as I’ve hit my forties I can add that to my resume for reasons that are still unclear to me. Some parameters to consider for this post were incorporating our major concepts of social justice, social change, arts, feminism, and women. That prompt alone, led my stream of consciousness to all things Wonder Woman and I just fangirled out and could find no cohesive way to move forward with my thoughts for this assignment. Then I remembered this beautiful memory forever captured as photographic blackmail. 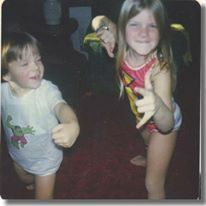 In my mind’s eye, I was wearing Wonder Woman underoos. Please disregard the Spiderman posture and Shazam replacement outfit. Growing up I often heard that I was bossy, stubborn, athletic, should smile more, moody, hardworking, creative, kind, and helpful. Those characteristics remain as much a part of my genetic makeup as my blue eyes, strong thighs and German heritage*. *Note – although many in my family claim to be “off the boat from Ireland”, with surnames including Kraut, Schubauer, and Schindler I do not believe Clark and Amsler are going to swing the tables in their favor. So, Carpe Diem! This was a political observation of Margaret Thatcher’s from the 1960s, but I believe she would allow me to misappropriate the sentiments to reflect my feelings of what I like to call the Dairy Barn Incident of 1994 and quite possibly the keystone moment that forever influenced my work ethic and alignment with feminist ideologies. Working at the Penn State Dairy Center was a simple summer job for me having grown up in central Pennsylvania. How does this tie to feminism you ask? Well this situation reflects a recurring theme in my life. There was a problem. There was a time constraint. A solution was needed. 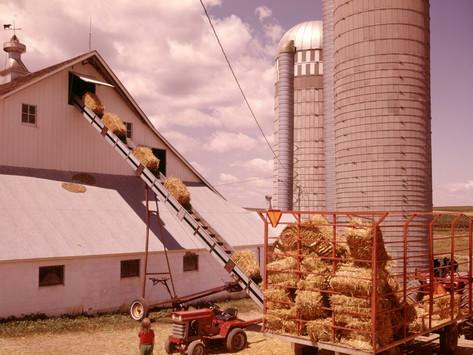 This seemingly benign situation involved the simple task of transporting 3 tons of hay bales into the second level of a storage barn with the use of a bale elevator (pictured below), a conveyor belt to move the hay from the elevator to deeper into the barn and physical beings to move and stack approximately 150 hay bales. The problem: shortage (or disappearance) of co-workers to assist with manual labor…I mean they scattered like rats (both fellow student workers and union guys). The two delivery guys were only responsible for moving the hay from the wagon to the elevator. The time constraint: a thunderstorm was fast approaching and you do not want to stack wet hay bales in the middle of a barn with inside temperatures approaching 100+ degrees. The solution: engage my competitive nature and love of Tetris to get those 150 hay bales stacked like a pro and avoid them spoiling from mold. The Dairy Barn Incident of 1994: I didn’t have an actual copy of a picture of C Barn at the Penn State Dairy Center, but this is a pretty good replica. Yep, EVERY SINGLE ONE of those words used to describe me as a child where clearly highlighted that hot July day in 1994 as I worked by myself to avoid stacking moldy hay bales and also avoid getting buried under them as they dropped a good 25 feet to the ground from the conveyor belt. My grandmother once told me, “If you work like a man, they’ll let you.” My thinking has always been, if I don’t they’ll surpass me. I can’t have that. I am a feminist. I’ve been female for a long time now. I’d be stupid not to be on my own side. ~Rebecca Amsler, MBA. Rebecca lives in Lancaster, KY with her wife, 3 dogs (of varying behavioral aptitude) and a cat that thinks she’s a dog. Becky works as Assistant Controller at Centre College.